More and more dental professionals are turning to remote work. When dentists and hygienists don’t need to be in the office, they can choose to work from home or even in transit. Unfortunately, tooth issues can crop up even on days off so dental professionals are always on-call. The solution? Accessing the office computer system from home or some other location. We live in a world that revolves around advancing technology and because of this, accessing critical information from home or elsewhere is easier than ever even after the office is closed and everyone has gone home. However, it is important to note that all remote users are vulnerable to security risks. 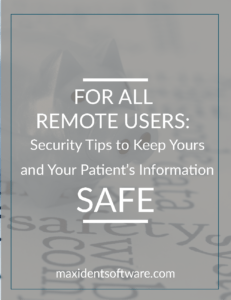 In this blog post, I will provide you with important tips to keep yours and your patient’s information safe from hackers. When it comes to security, being aware of the existing threats to your security is crucial to prevention. Remain up-to-date with any new threats, keep all your systems and antivirus software updated and use passwords that will be hard to guess. Never use the names of anyone close to you or anything even remotely related to you. The best password is one that consists of uppercase and lowercase letters, numbers, and symbols. Always keep them within your sight and on you at all times. Never leave your laptop alone for any reason. If you are in a public place and need to grab a coffee or something to eat or even if you have to use the facilities, bring your laptop with you. Should you leave it or your mobile device alone, not only will your laptop and your mobile device be vulnerable to hackers, they will be vulnerable to thieves. Email is always the hacker’s way in no matter what the content. This is where it all happens and even where some of the threats start. Be password savvy. Choose passwords that are long, difficult and if it means anything at all to you, make sure you’re the only one who knows it. Be aware of vulnerabilities to your email in order to identify the common and even not so common threats such as– phishing emails (emails that ask for personal or financial information) and policies on what information should not be communicated in an email– logins, passwords, credit card numbers, security information, etc. Ransomware has also become the new and most malicious threat; even though it can be transmitted other ways, email seems to be the hacker’s favorite. We have more tips about this particular threat in this blog post, so please take the time to read them. When it comes to any removable device, it is always important to scan for malware. Better safe than sorry as the saying goes. When it comes to your own business flash drive, it is important to keep it on your person at all times. Don’t let anyone use it, even if they insist that their only intention is to provide you with information you don’t have. That’s what email is for. When it comes to removable devices provided by anyone, including legitimate organizations, always scan. Even those most trusted might not know that their software has been corrupted. It is up to you to remain wary in the name of your patients and your own security. Remoting in is one way to access your computer system from your own home computer or mobile device, but keep in mind that there are security risks to this as well. Ammyy, found here, is only one of many programs capable of allowing remote users to access their office information; however, you want to make sure that the program you’re using is protected with a password. It is as simple as a click of a button for a hacker to take over your computer. I’ve seen it. Protect your information with a password. And never ever let anyone access your program to remote in for any reason.